25 years I already open my games exclusively with e4. Also as long I answer 1.e4 exclusively with e5. In other words I have quite some experience with the position 1.e4 e5. 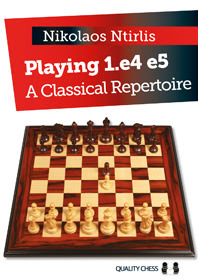 It is therefore no surprise that some players asked for my opinion of the recently published repertoire-book Playing 1e4 e5 a classical_repertoire by Nikolaos Ntirlis. However to be able to judge a book, you first need to get the chance to read it. That is a problem as I don't buy any books about openings since 20 years. Fortunately my team-mate Daniel Sadkowski was so gentle to borrow me his book for a week which allowed me to check the content. I know the author Nikolaos since 2009 when we were discussing furiously some analysis at chesspub forum lasting several months. Despite our initial disagreements things went afterwards much smoother between us. We both realized that we only were trying to search the truth of a position so no reason to feel emotionally bad about any critical analysis. In 2009 Nikolaos was still unknown. Today he has built a solid reputation as opening-specialist. Playing 1.e4 e5 is already his 3rd opening-book and in the meanwhile his 4th about 1.d4 d5 is released see qualitychess. Besides any of those book was welcomed very positively. That is an extraordinary performance especially if you know that Nikolaos doesn't possess a fide-rating. By hard working, a lot of research and knowing how to maximally use the engines a lot can be achieved. By the way he also tests his analysis in correspondence chess with some decent success. This is enough introduction of the book. Time to evaluate the content. Well I will be short. I warmly recommend this book to anybody interested playing this repertoire. The quality of the analysis is excellent and the light writing-style makes it very easy to read and digest. However for myself there was not much new. That is also to expect if you have 25 years of experience with the repertoire. This book would've been very useful for myself 15 years ago on my road to the FM-title. Meanwhile I made in most cases exactly the same conclusions as Nikolaos which is of course a compliment for the book. Still I wouldn't write this article if I could not add some remarks to the book. So what follows next should be considered as an annex to the book and not an attack. The first thing I want to discuss is the chapter about the Belgrado-gambit. I noted Nikolaos claims a small advantage for black so more or less refuting the gambit. The review from the Australian grandmaster David Smerdon warns the readers that many refutations of so called black advantages are well hidden in the book. However this was not the case for this gambit. I have studied it several times in the past as happened last year with one of my students at the bjk. Never I was able to refute the gambit so I became curious if Nikolaos really has found something close to a refutation. Unfortunately after doing some research I had to conclude that Nikolaos had missed an important idea. I really would've loved to see that annoying gambit disappearing from practical standard play. Of course this is just a detail as the gambit anyway remains a very small side-system in practice. Totally different is the Spanish Breyer-opening which is used as the terminal of the repertoire-book. The keystone of any Spanish repertoire is always a soft spot. Somehow you must make a choice of how you will fight against the critical mainline. Now about the Breyer-opening you can write a complete book. On the other hand I was a bit puzzled to see only 1 real chapter about this big opening. Besides I also wonder if this is really the best choice to make for such kind of book. I guess the target-audience is between 1800-2200 elo and the Breyer seems a risky choice for them.I demonstrated recently how risky it can be in the last round of Leuven. My opponent FM Arno Sterck also Belgian youth-champion - 18 was already lost just after the opening. Nikolaos recommends a different line of the Breyer-opening. He very often refers in his analysis to the correspondence-games of the Russian Senior International Correspondence-master Igor Telepnev. However also from pure theoretical perspective I have my doubts about the selected system. There are some lines which are nowadays rather shaky. Naturally I admit that a 1800-2200 player will rarely encounter such highly sophisticated analysis. On the other hand we should not ignore that maybe the Breyer-opening is too complex for the amateur. But which opening is better? I play the Spanish Chigorin but I can't recommend that although I obtain very acceptable results. The Berlin and the Marshall-gambit are surely theoretical more stable but these openings won't seduce the average player. So I also don't know what could be the perfect cornerstone against the Spanish. I need more experience with different systems to get a better view of each qualities. Only by experimenting you can find out which systems are enjoyable. Anyway don't get discouraged of this article and give the Breyeropening a chance.